On Sunday's MSNBC Live with Alex Witt, after panelist Jennifer Grossman invoked Martin Luther King's historic "content of their character" statement, TV One journalist Roland Martin, in a demanding tone, requested a "favor": "Please don’t quote Dr. King." Apparently in Martin's world, only a black person like him can quote King, while a white person like Grossman can't. To her credit, Grossman pushed back hard: "I will quote Dr. Martin Luther king every single day and you won’t stop me." The subject was the release of the spring White House interns photo showing a predominantly white group. Witt claimed that this photo "sparked quite a firestorm due to what is viewed as a lack of diversity." That "firestorm hardly signifies anything, given how even innocuous things relating to Trump spark firestorms. In the first of two snips in the following video excerpt, Martin effectively invoked "black privilege" over Dr. King utterances. His statement came after Grossman argued that there is "probably ... more diversity in terms of political viewpoints (in the intern class) because President Trump’s election has stirred things up." Grossman quite properly tried to interrupt Martin's racist demand, during which Martin repeatedly shouted over her in an attempt to drown her out. ALEX WITT: That makes me think about the photo of the President with the spring internal class. It sparked quite the firestorm online, due to what many are seeing as a lack of diversity. And the same issue was raised in last year's photograph. It’s kind of hard to see this and not judge it on its face. Of course, it’s possible that there’s more to this than meets the eye. You have to talk about the applicant pool overall, certainly. But what are your thoughts on this? JENNIFER GROSSMAN: Well, my thoughts are largely that the most important thing is the content of our character and what’s in our heads and our ideas and our thought, not the color of our skin. So whether or not you have racial diversity in that intern class, I would argue probably you have a lot more diversity in terms of political viewpoints because President Trump’s election has really stirred things up. So you probably have Republicans, you probably have conservatives, social Republicans, libertarians. So I am a little concerned about wanting to create campuses or intern class(es) in which everybody looks different but thinks the same. I think it’s better we have more diversity in thought. ROLAND MARTIN: No, Jennifer. No, Jennifer. Do me — No, Jennifer. I’m sorry. WITT: You know what, Roland, I want you to respond, but I’m going to put up right now a picture of President Obama with his White House interns, just so we compare. But go ahead and continue, Roland. GROSSMAN: No, no, no. I will quote him every single, no-no-no. And this kind of thing does not work —. MARTIN (deliberately talking over Grossman): No-no-no-no, one second. One second, no-no-no, one second, one second, one second. Allow me to finish. Allow me to finish. Allow me to finish. Allow, allow, allow, allow me to finish. Allow me to finish. Allow me to finish. Allow me to finish. GROSSMAN: If you want to have more debate on race, your political correct bullying is not going to work. I will quote Dr. Martin Luther king every single day, and you won’t stop me. MARTIN: Alex, here's my point. See, people love to quote the bottom of that speech, but they want to ignore the top of that speech when Dr. King said, America gave black folks a check stamped insufficient funds, in that speech where he talked about combating police brutality, in that speech where he talked about giving black folks the right to vote. So that speech is an extensive speech. And the fact (is) the part she’s quoting wasn’t even in the written speech. Here is the point, Alex. The issue is this here. By 2020, more than a majority of America’s children under 18 will be minority. We will be a majority minority country by 2043. You look at Trump’s judicial appointees, 92% are white. And so when you look at this class, these are future leaders. And wo if you have a class that is largely absent of minority people, these are the folks who will be leaders in the next 10, 15, 20 years. You better have a diversified class to lead a diversified America. Otherwise you’re going to have the same problem. GROSSMAN: But I would also make a note that President Trump got higher percentages of the black vote than Mitt Romney did, so I think that he's doing something right. MARTIN: Actually he didn’t. Actually you’re wrong. 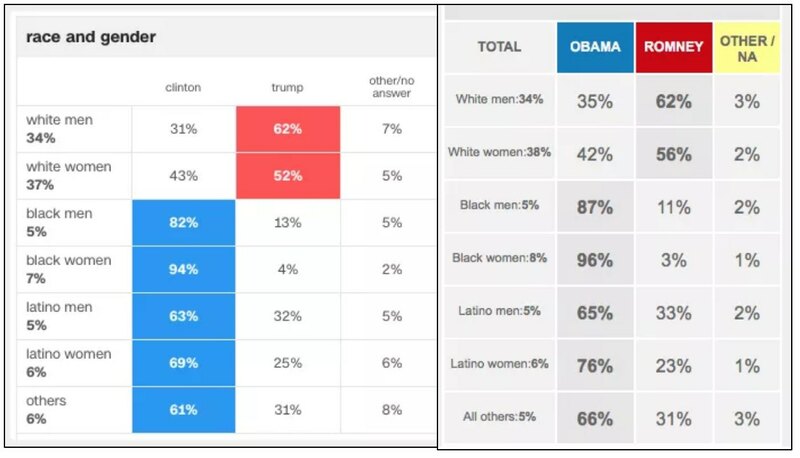 And the fact of the matter is 94% of black women voted for Donald Trump — excuse me, voted for Hillary Clinton — and there was a nine-point gap between black men and black women, the exact same nine-point gap that Mitt Romney had with Barack Obama. Actually on that point, you’re wrong. Though the improvements aren't impressive, Trump drew 13 percent and 4 percent of black men and women, respectively compared to Romney's 11 percent and 3 percent. The nine-point gap between black men and women is actually greater than Romney's eight points, but Roland Martin's "You're wrong" claim was a response to Grossman's assertion that Trump "got higher percentages of the black vote than Mitt Romney did." He did, and Martin is wrong. Speechwriter Clarence B. Jones said King "improvised on the spot." The inspiration behind how King came to say what he did, and to then spontaneously build on it, only strengthens its transcendent importance. ... From that moment on, King’s cadence changed as sentences and ideas built on one another to reach powerful crescendos.